With the New Year in full swing, now is the time to plot out your 2019 goals. When you have a clear plan of attack, it makes reaching your target that much easier. When you have an enormous goal like saving for a down payment on a house, running a marathon, or losing 50 pounds, it’s helpful to narrow down the goal to smaller steps. Look at the calendar, pick a realistic deadline and then work backwards. Let’s use losing 50 pounds as an example. A healthy weight loss rate is 1-2 pounds per week. So you would give yourself 30 weeks or a little over 6 months to lose this amount of weight. When you break a huge goal down into bite-sized segments, it becomes less scary and more attainable. Now you can break this down into 90-day, 60-day and 30-day goals. From there, you can give yourself weekly goals. Week #1 may be figuring out what diet and exercise program you will do. Week #2 may be tracking your food and establishing an exercise routine. Studies show that the odds of reaching your goal significantly increase the minute you write it down. Whether you create a list of New Year’s resolutions or have just one major goal to achieve, write it down in a journal, on a post-it that you can see every day or hang it on your refrigerator. Take it a step further and create a vision board with images of what your goal looks like. Having to answer to someone can definitely put your motivation into overdrive. 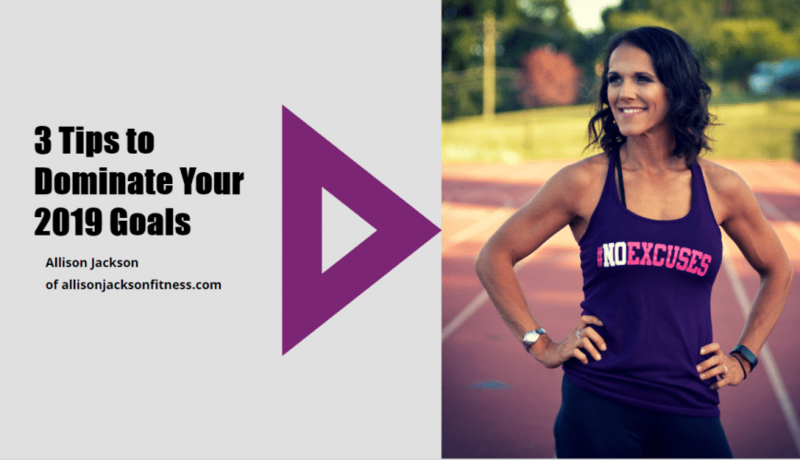 Do you really want to share that you haven’t made any progress towards your goal? Whether you enlist a coach or a friend, many times you will go above and beyond what you set out to do to prevent having to share any kind of failure or slip-ups. January 1 is always a nice fresh start to crush your goals. Break out some paper, plot it out, get a friend or coach to hold you accountable and let’s dominate 2019. If losing weight is on your list, my Blast the Fat group coaching program starts on Jan. 7. Sign up now and get a free sample pack of Hacked Snacks, macro-friendly snacks that the whole family will love.